Hi, everyone! 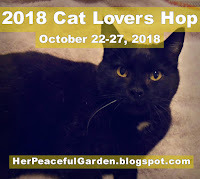 This is the fourth post of my blog blast of cat-themed projects for the Cat Lovers Hop! A special thank you to Janis at Her Peaceful Garden for hosting this wonderful event to celebrate our love of kitties! The hop runs until tomorrow so there is still time for you to join in the fun! I'm excited to be joining this hop for the fourth year! For an update on my husband's health, please see my first post here. Last spring I was involved in a cat-themed swap, and part of the swap was to make some pretty packaging. This is a small gift bag that I decorated to hold some swap items. 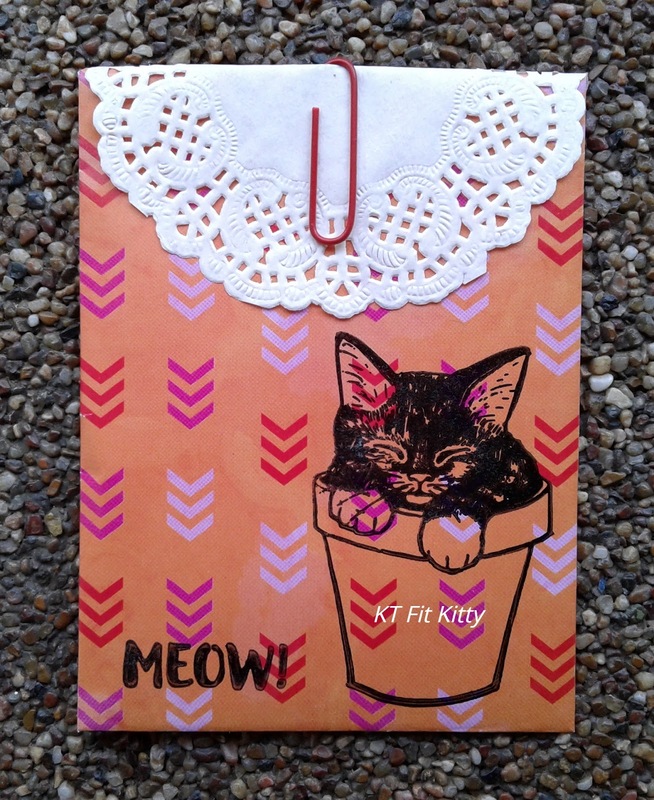 I stamped the adorable kitty and word (Fiskars Friends Furever) in black on a small gift bag (Dollarama). I added a doily from my stash and a red paperclip to keep it closed. Thank you for looking at my gift bag! Wishing you a joyful day and Happy Hopping! Sweet packaging! Love that kitty snoozing in the pot!! Thank you for your 2nd participation in our challenge at Carlin's Kaartenparadijs. Simply beautiful. I love how things come together for you. I need to remember to not overthink. Another sweet envelope. I have that kitty set and need to use it! Oh, my, that has to be the cutest little kitten ever curled up in the flower pot! Love the patterned paper for the envelope. Oh my! How cute the kitty in the pot is!!! Cute and sweet bag!! That sleeping cat in the pot makes me smile!! Another fun way to package some crafty goodies. Cute envelope and adorable image! The lace just finishes it off really well!! What a gorgeous Kitty! Love the doiley and the colours! Oh, this is so cute--both the sweet kitty and the adorable little treat bag! Just goes to show it doesn't have to be elaborate to make something extra special. Thanks for playing with The House That Stamps Built. This is so cute and I love the doily that used to embellish your envelope. That cat stamp is adorable. Great stamp with the sleeping kitty. So cute. Love the kitty in a pot and the doily. Love this kitty cat image! It's super adorable! Love how you added it to your envelope! The image on the bright paper looks fantastic. 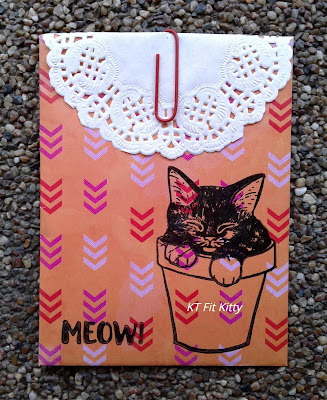 I'm so very happy you linked your sweet kitty card up to the Anything Goes challenge over at The House That Stamps Built! Such an adorable sleepy little baby!! Awwww.... Love your stamping on the patterned bag. Looks fabulous with the doily to dress it up!